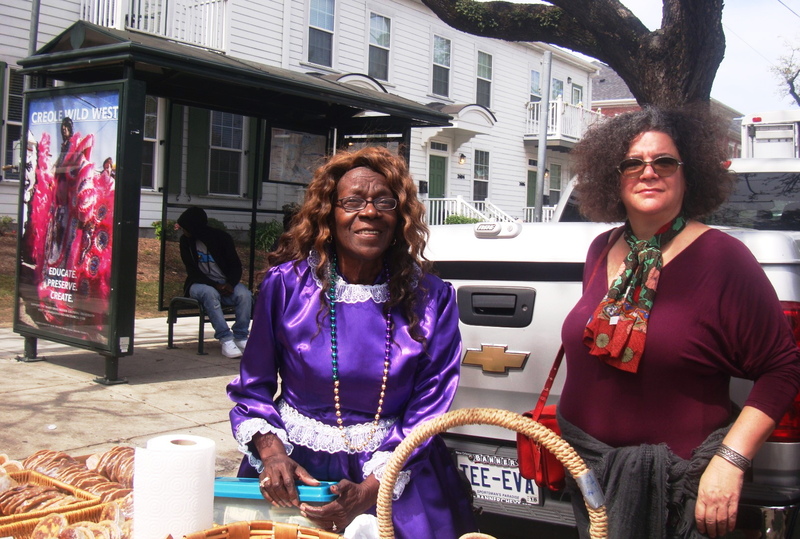 Eva Louis Perry, one of the finest praline makers to ever draw a breath in New Orleans, prepares to set up her booth at Super Sunday near Shakespeare Park in Central City. Miss Tee Eva passed away last year at the age of 83. 25 years earlier, Perry, along with Ernie K-Doe’s widow Antoinette, formed the Ernie K-Doe Baby Dolls and was credited with helping revive the baby doll tradition. If you rolled on a second line in New Orleans anytime in the past 30 years you definitely saw Tee Eva on the route with a big basket stuffed full of miniature pies and sugary pralines. This entry was posted in Louisiana Daily Photo and tagged Louisiana Daily Photo, Miss Tee Eva In Central City, rl reeves jr. Bookmark the permalink.